Puree the blackberries and then strain them through a wire mesh sieve. Combine the berry puree, honey, vinegar, honey, kosher salt, black pepper, orange zest and juice in a bowl and whisk while slowly pouring a steady stream of the olive oil. Taste to check seasonings, adjust if needed and set aside. Divide the greens among plates. Quarter the pears and remove the center core/stem. 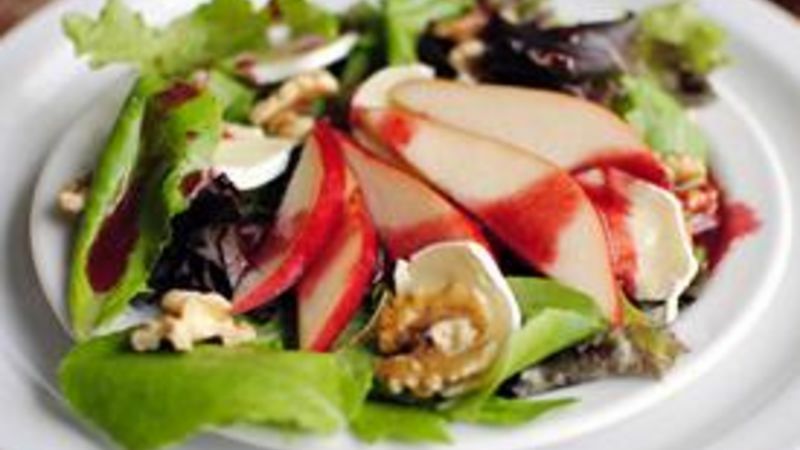 Slice the pears into thin pieces, arrange on top of the greens and sprinkle with a little kosher salt. Slice Brie and scatter evenly. Drizzle with the blackberry vinaigrette and garnish with the toasted walnuts.